Location: Between Harrisburg and Eldorado, turn East off Hwy 45 on to Wasson road. Go ½ mile and turn North onto Agin Rd. to the first house. Signs posted. This home place has lots to offer. Two large out buildings, 2.3 +- acres, and a 3 bedroom house. 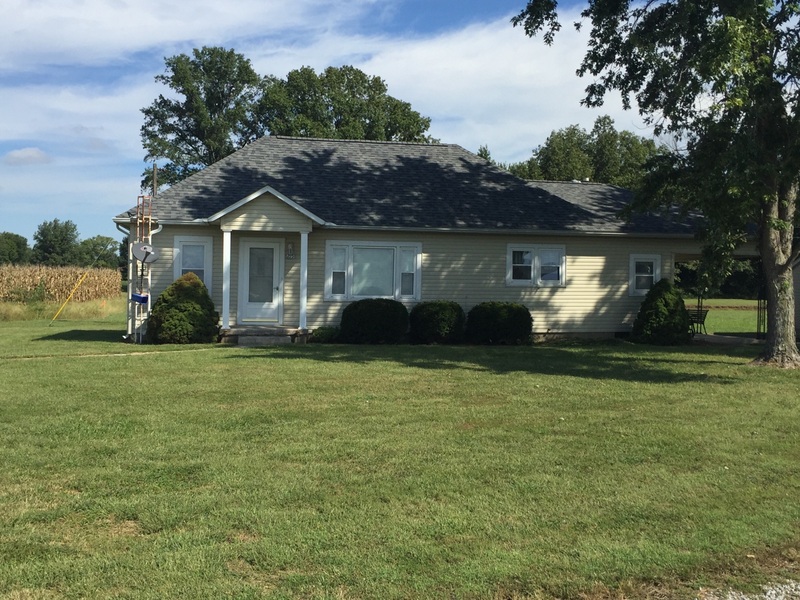 The house has a new roof, new septic system, new replacement windows, and vinyl siding. Inside is a large kitchen/dining room, 3 bedrooms, living room and bath. There is a covered patio/porch. All utilities including natural gas. It’s move in ready. Large yard with two metal buildings. One is 56’x40’ with concrete floor & two large garage doors. The other is 50’x54’ pole building with one side open and a gravel floor. Both are extra tall. Behind the house is a 14’x24’ storage building. If you want to be out of town this is it. House offered at 2 PM. Furniture after the Real Estate. Terms: $2500.00 down auction day with the balance due at closing within 45 days. Make all financial arrangements prior to the sale. Normal proration’s to apply. To view the home call the auctioneer. Photos on our web site. Personal Property: New Whirlpool side by side refrigerator with ice & water in the door * new Whirlpool Gold model electric range oven * Kenmore washer & dryer * chest deep freezer * older range * 46” flat screen TV * microwave * nice sofa * 2 swivel rockers * antique glider rocker * Oak computer desk & computer * Nice large dining table with 8 chairs & hutch * two 3 pc. Bedroom suits * small glass curio cabinet * lamps & end tables * normal kitchen items * Corelle dishes * Corning ware * card table & chairs * metal lawn furniture * double key wind clock * large bolt bin with bolts * 2-4’x8’x1/8” steel * 7x9 garage door * Sears 3hp., 80 gallon tank air compressor * chain hoists * come a longs * chains * John Deere cylinder & fender mounts *ladders * Jen pole * overhead fuel tank, diesel and related shop items.